The Dakotas were two states that I’d never visited before, and I’d been looking forward to checking them out on this trip. 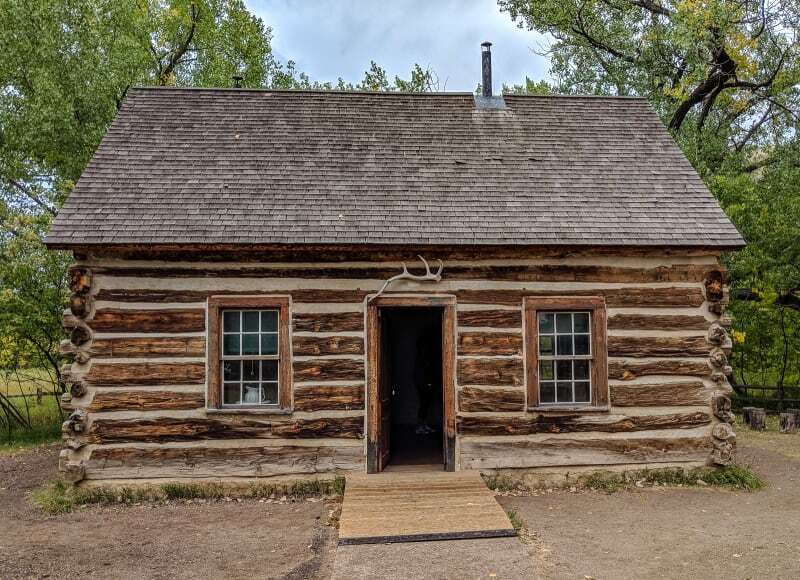 I’d originally hoped to spend a few weeks exploring both states, but our deadline to reach Montana moved up a couple weeks to accommodate flight schedules, so our time here was cut a little short. We tried to fit as much as we could into the time we had, though. 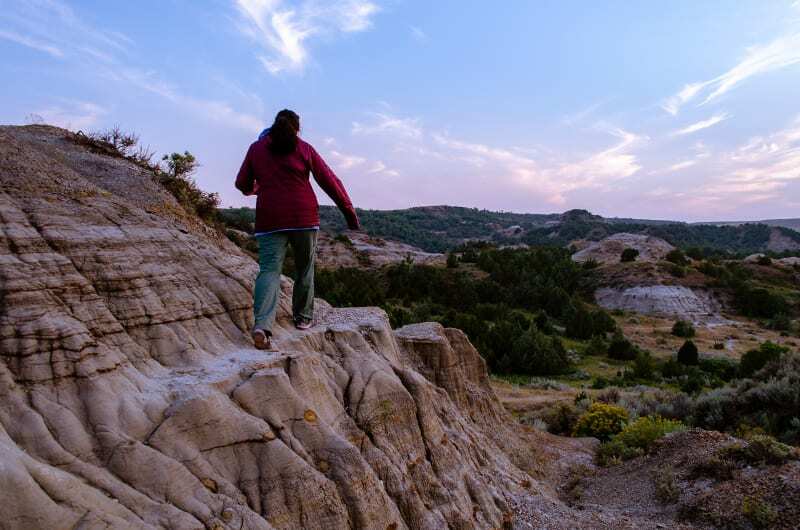 Let’s be honest - eastern South Dakota isn’t really known for its sights, so we skipped right over that and headed to Badlands National Park. 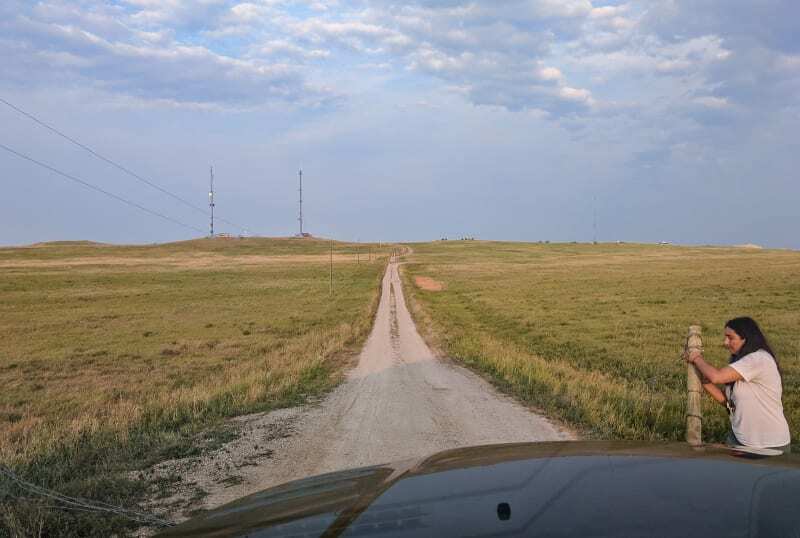 We camped at the Nomad View dispersed camping area in Buffalo Gap National Grassland. We’d camped without any hookups in the past, but it was always either an overnight in a Harvest Host parking lot or in an established campground. This was our first time boondocking at a free site on public lands. It was also a campsite that I picked out before we even left on our trip. When we were prepping the RV and deciding how much to spend on our off-grid solar setup, I did some research into boondocking to make sure it was something we actually wanted to do. In my mind, free campsites on public lands were probably not places you really wanted to be, so I was a bit hesitant. Then I came across Nomad View. It’s one of the top rated camping locations in the country, and it’s free! I looked at the pictures, and I was sold. 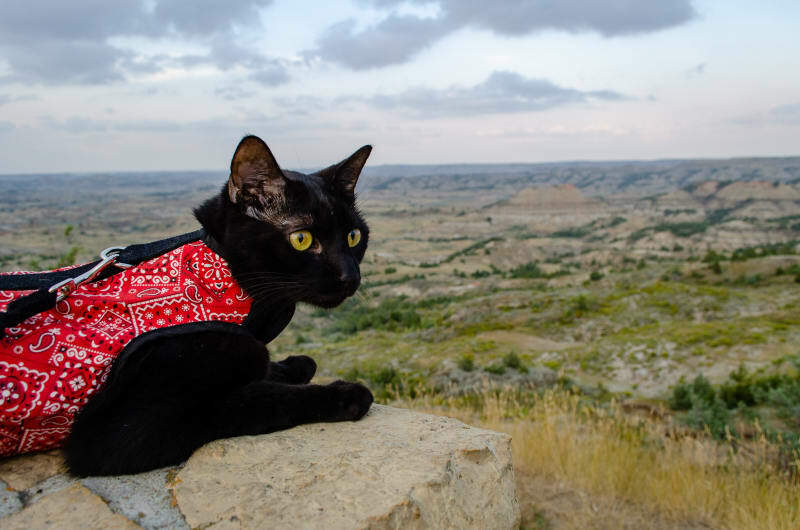 Badlands National Park is located within the Buffalo Gap National Grassland, and the Nomad View dispersed camping area is only a mile from the park entrance. 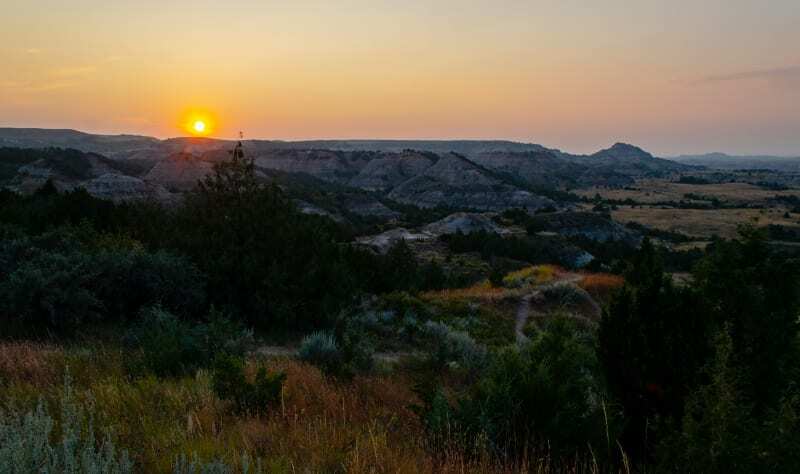 You camp right along the cliff of a badlands formation, and the view rivals any that you see in the park itself. We arrived around 7 pm, which isn’t ideal for a first-come, first-serve camping spot, but we were still able to find a nice spot along the cliff. We settled in and ate dinner by the cliff edge while the sun set behind us. It’s going to be tough finding a campsite that tops this one. The kitties wanted to explore. Mango definitely tried to run down the canyon. He’s still not quite ready for roaming off-leash. Badlands National Park is best known for its distinctive rock formations which are multicolored, heavily eroded, and lack vegetation. On our first day in the park, we joined a ranger-led geology hike to learn about the rocks and their history. The name of the park means exactly what you think - native americans and early explorers called the harsh, rocky landscape “bad lands”. 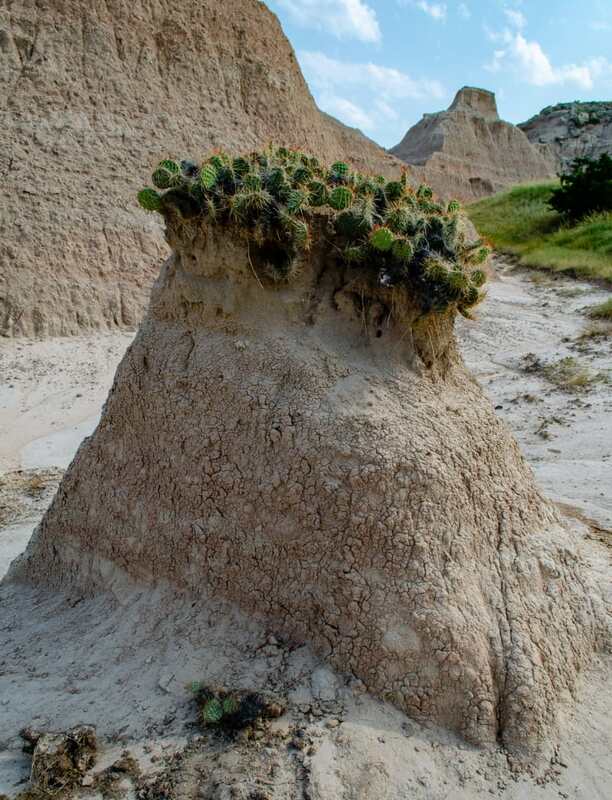 This type of rock formation isn’t unique to Badlands National Park, but the formations are named for the rocks found in South Dakota. In the park, the lowest layer of the rock is shale that was deposited when an inland sea covered the middle of the country. When the sea receded, rivers and volcanoes continued to deposit sediment in the area, and the various colors come from the differing rocks and vegetation that existed in the area over time. The soft, sedimentary rock erodes very quickly, at least on a geological time scale. The area only started eroding about 500,000 years ago, and estimates suggest the area will completely erode away in another 500,000 years. For some perspective, the Appalachian mountains have been eroding for about 500 million years, and they still have a long way to go. 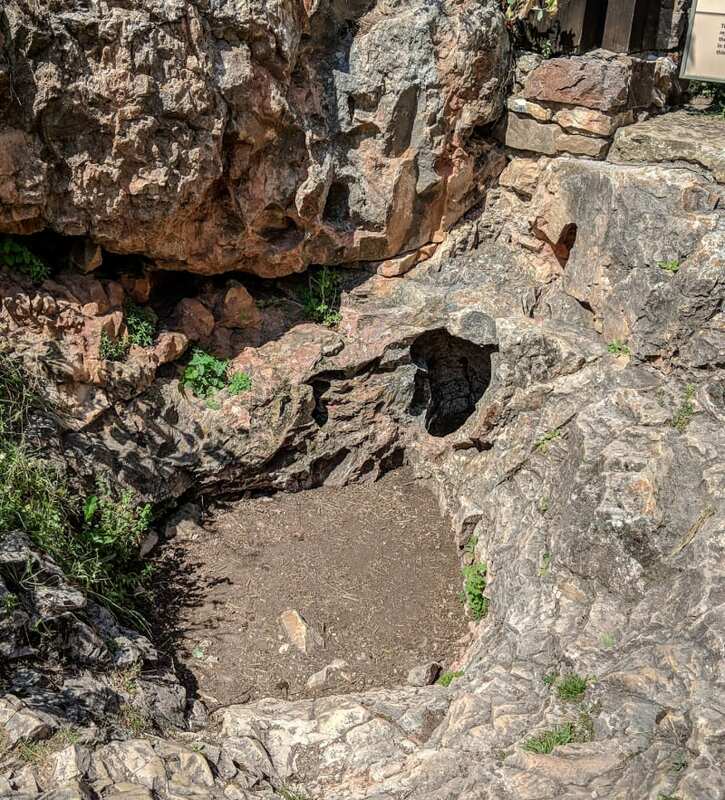 With such fragile rock formations, we expected that the park would be very strict with where you could explore; however, the opposite was the case. 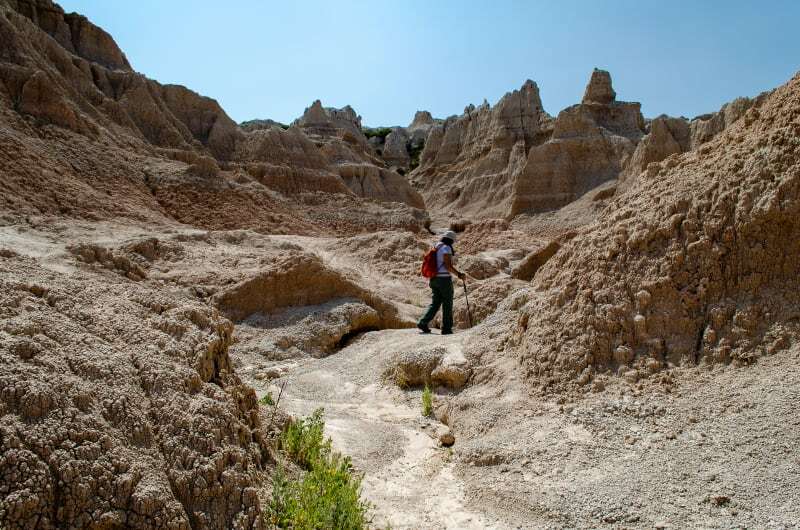 Badlands National Park allows visitors to wander off-trail as they please and explore wherever they want. Because weather erodes the rocks so quickly, it is much more significant than the effects humans have, so they don’t really worry about it. After the ranger talk, we did some short hikes on the Window and Door trails to explore the rock formations up close, and we drove the main loop through the park to check out the various overlooks. 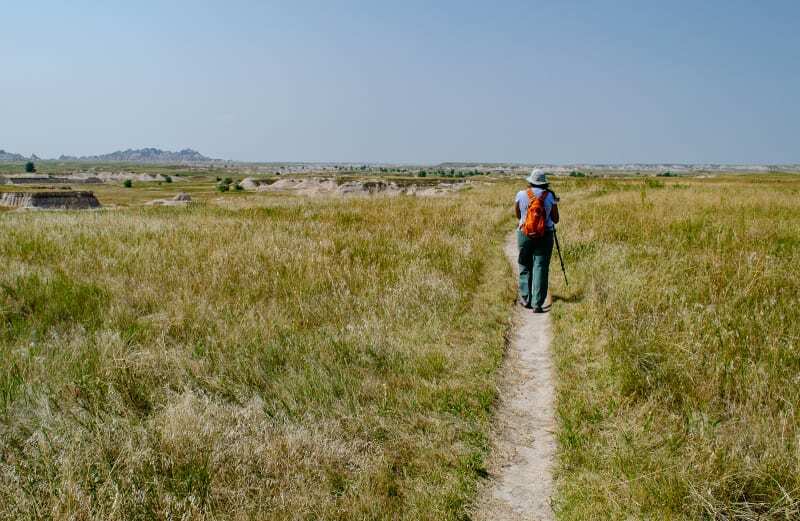 While the inhospitable rocks are the subject of pretty much every picture you’ll find of Badlands National Park, the park also contains one of the largest mixed-grass prairies in the country. 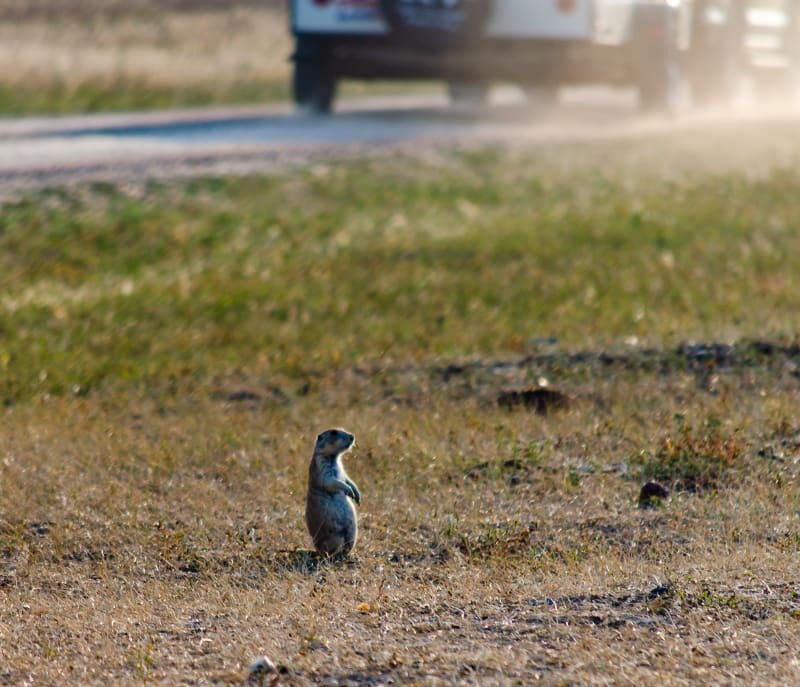 The prairie contains over 400 different plant species, and it’s also home to a lot of wildlife. 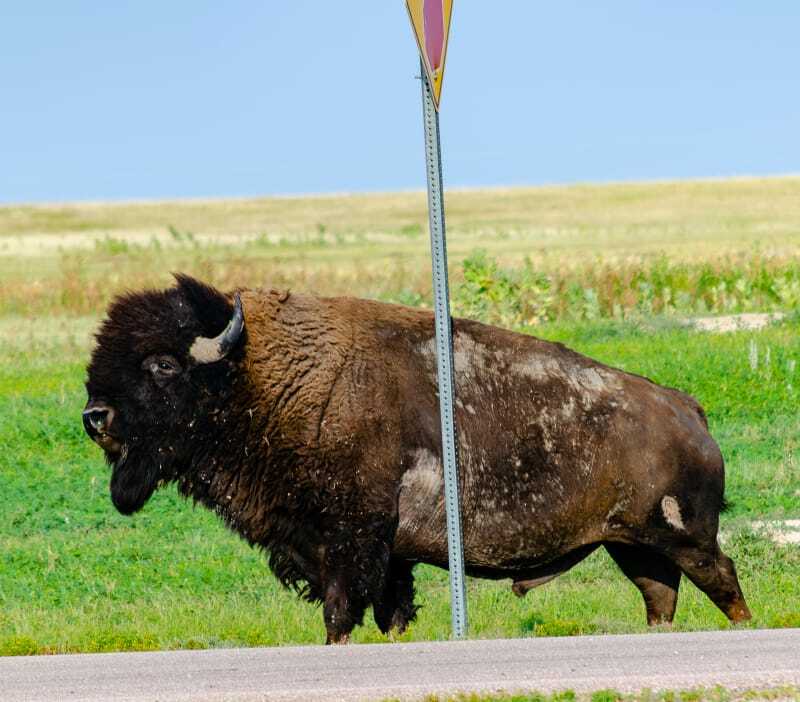 We hadn’t really seen many notable animals on the trip yet, so we were very excited about our prospects in South Dakota. On our first morning in the park, we saw Bison and Bighorn Sheep right along the park road! 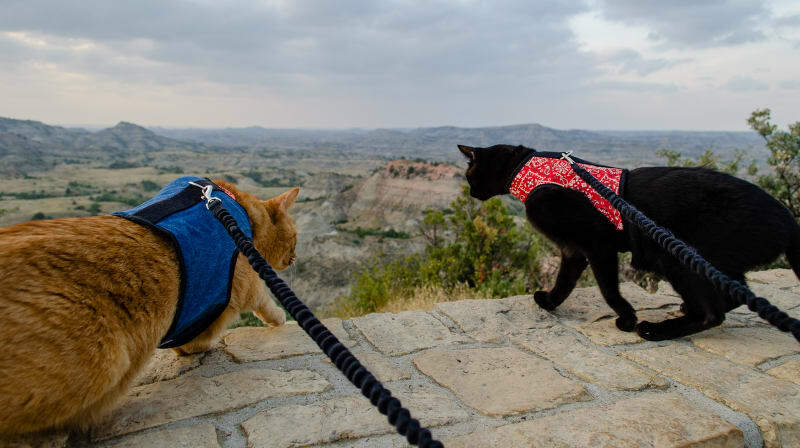 To round out our trip to Badlands National Park, we set out to hike the Castle Trail. 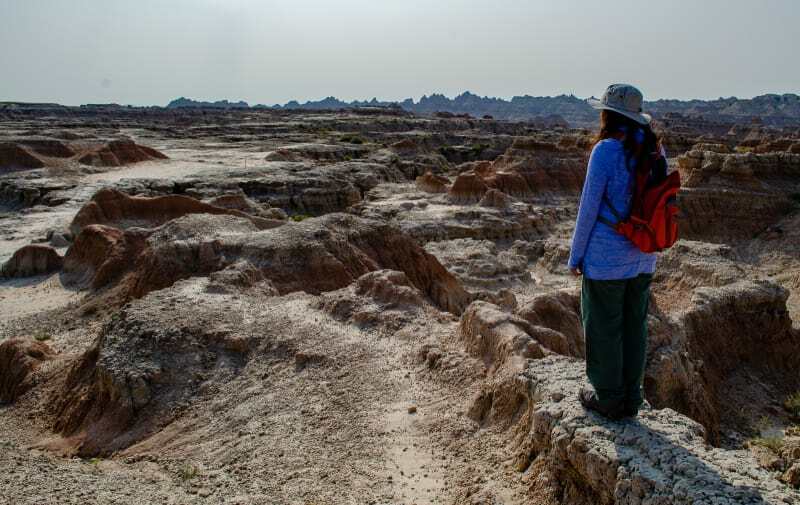 The trail starts along the north edge of the Badland Wall and weaves through the spires, buttes, and fins of the badlands. Seeing the towering, multicolored rock formations up close was a great experience. 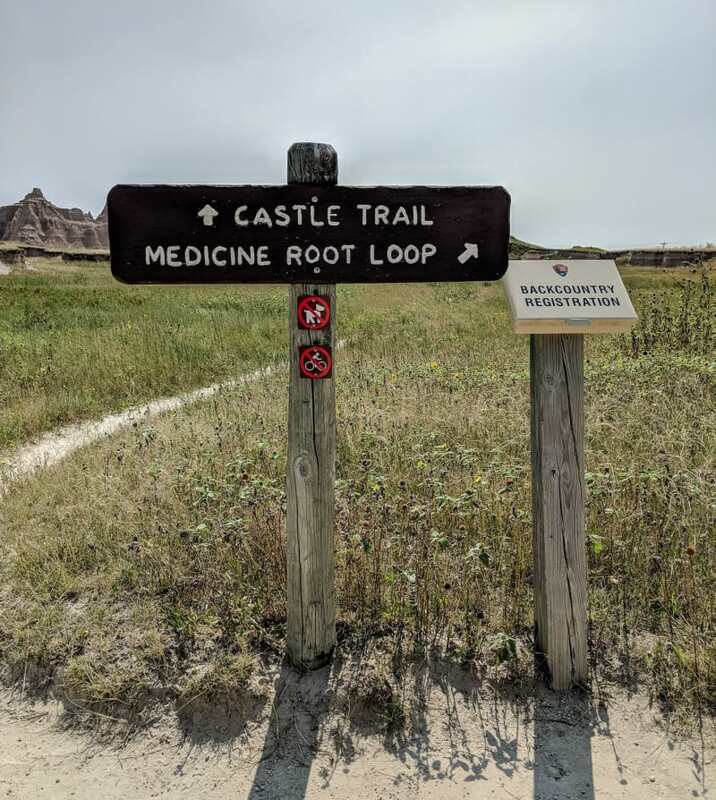 On the return, we followed the Medicine Root trail which moves away from the rocks and into the mixed-grass prairie. The prairie wasn’t quite as scenic as the badlands, but the sense of isolation it gave was awesome. You could see all the way to the horizon yet there were no signs at all of any civilization. It was a very different feeling than being in the mountains, but it was a great experience. If you visit the park, we highly recommend this trail as a way to enjoy all the park has to offer. 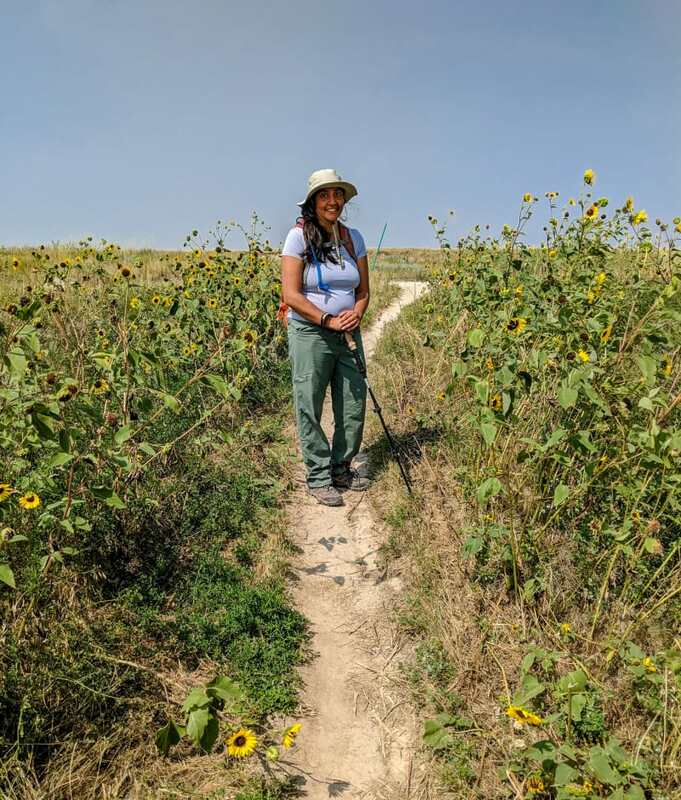 We found some sunflowers along the trail! As we were completing the Castle Trail hike, we saw dark clouds starting to move towards us. We were almost back to the truck, so we weren’t too worried, but then we started receiving weather alerts on our phones. A powerful storm popped up near the entrance to the park. They were reporting heavy rain, golf-ball sized hail, and 70+ mph wind gusts. It wasn’t going to hit us as we finished the hike, but it was definitely going to hit the RV which was parked near that entrance. There were no storms in the forecast, so we’d left windows open, but even if we hadn’t, RVs aren’t really built for heavy storms. To make it worse, the RV was parked along the side of a cliff and completely exposed. We scrambled to get to the truck and rush back to the RV, but we were almost an hour away. We wouldn’t be able to move the RV out of the path of the storm, but we could at least close the windows, pull in the slides, and move the cats into the truck for safety. Unfortunately, when we were about 15 mins away from the RV, the storm hit us. The rain and winds were so strong that we had to exit the highway, hide under an overpass, and wait for it to blow over. Given how strong the storm felt in the truck, we had no idea what to expect when we returned to the RV. Were the winds strong enough to blow the RV over? Would windows be broken or blown out? Solar panels ripped off the roof? Would the cats be ok? There was nothing we could do except sit and wait, and it was terrible. When the storm finally passed, we finished the drive back to the RV expecting the worst. Luckily, as we approached the RV, we saw that it was still standing, and that alone was a pretty big relief. We could tell something wasn’t quite right, though. A large white object was covering part of the roof. The high winds had caught the slide topper (a small awning that covers the top of our slide), blown it off its supports, and crashed it onto the roof. The slide topper itself was destroyed, and it landed on top of our AC unit and put a large hole in the cover, but otherwise things looked ok. 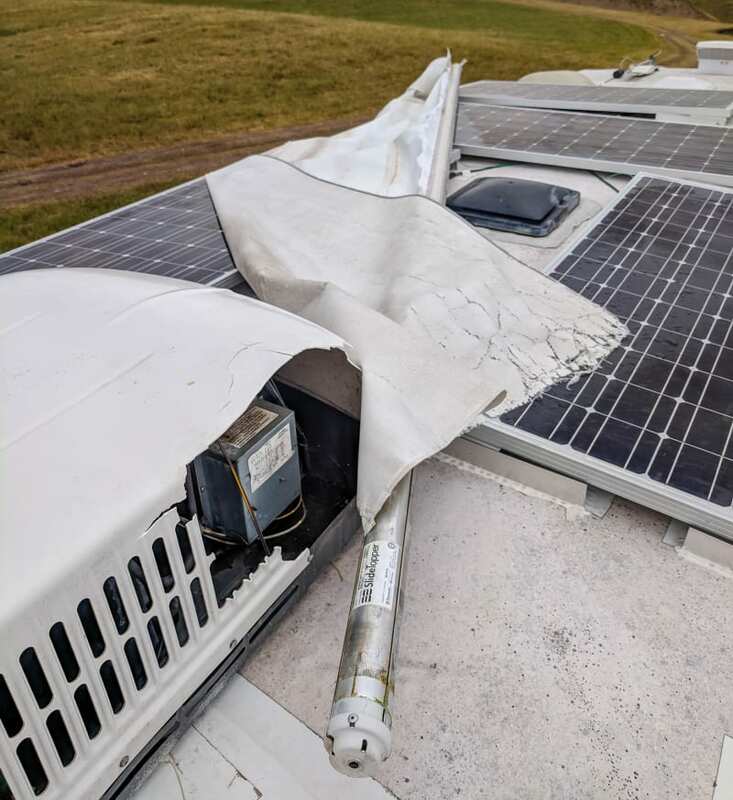 The solar panels were intact, and they survived the impact with the slide topper. That’s not supposed to be there. Inside, the entire living room was covered in a puddle of water, and the couch was soaking wet, but there wasn’t any major damage. The wind was even strong enough to blow water through the seals around the closed windows in the bedroom, so the floor and bed were a bit wet, too. My laptop was sitting in a puddle of water, but none of it made it inside, and the laptop was fine. The kitties survived the ordeal, but they were definitely shaken up. A normal storm is pretty loud inside the RV, so I can’t imagine what this one was like. We were very lucky that all of the damage was cosmetic. We moved to a full-hookup campground the next day so we could run the AC and dry everything out. The AC cover was easy to replace2. The slide topper would have been expensive to repair or replace, but it isn’t necessary to have, so we’re going without it for now3. 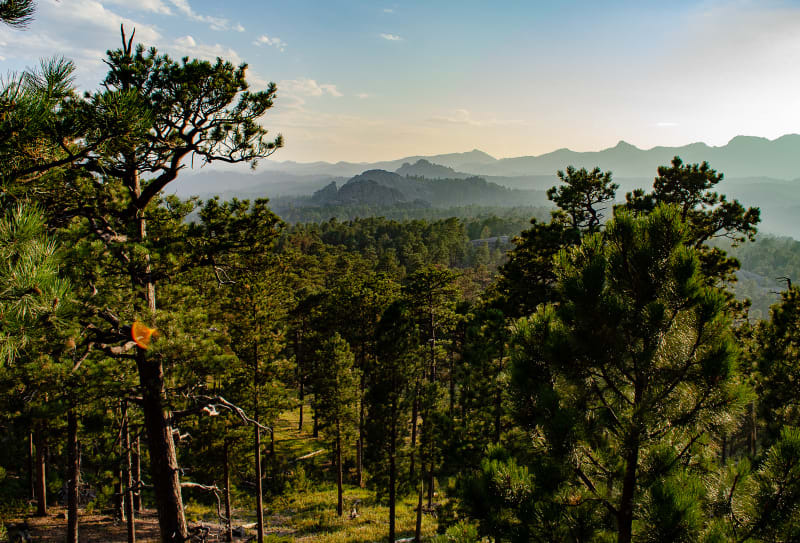 After the Badlands, we moved west into the Black Hills. I’d read that you could spend weeks in the area and not see everything, and I definitely believe it. Unfortunately for us, we only had a couple days to spend. It’s an absolutely beautiful area, though, and it’s at the top of my list of places I want to return in the future. Our first stop in the area was Wind Cave National Park. 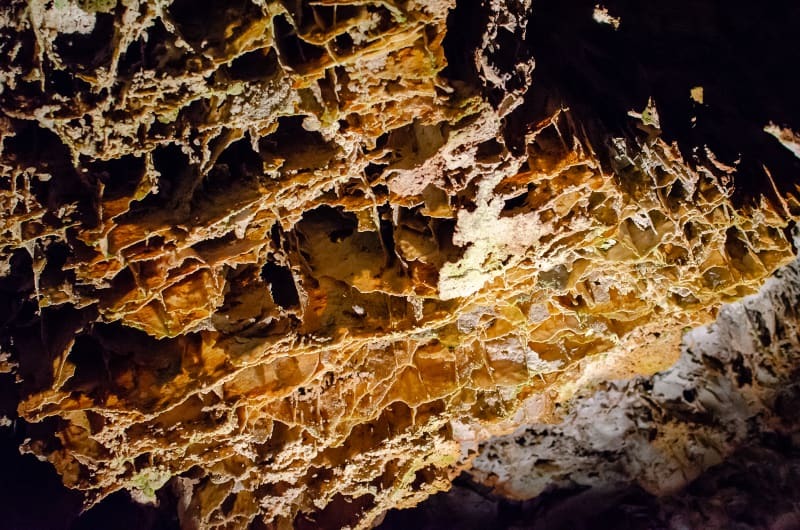 Wind Cave is one of the longest and most complex caves in the world with over 140 miles of explored passageways and many areas that are still unexplored. 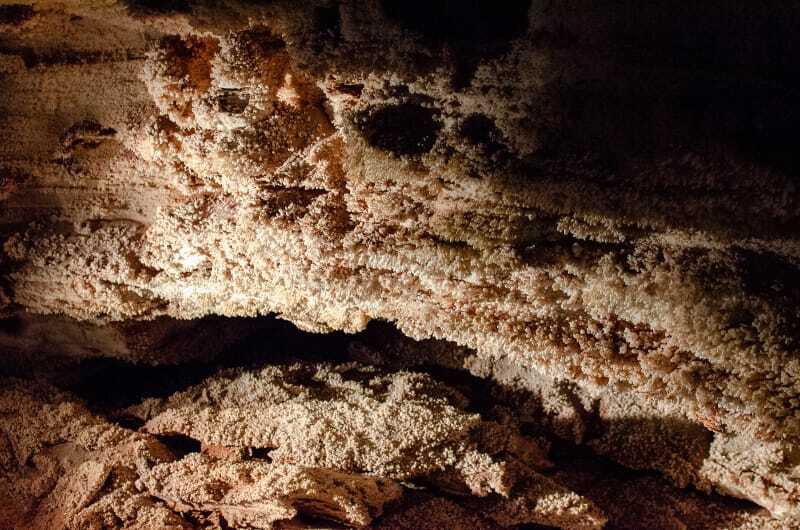 The cave got its name from the wind that blows out of the original entrance to the cave. South Dakota is known for rapid changes in weather and barometric pressure. Air will rush into or out of the small cave opening to equalize the pressure of the cave and atmosphere. 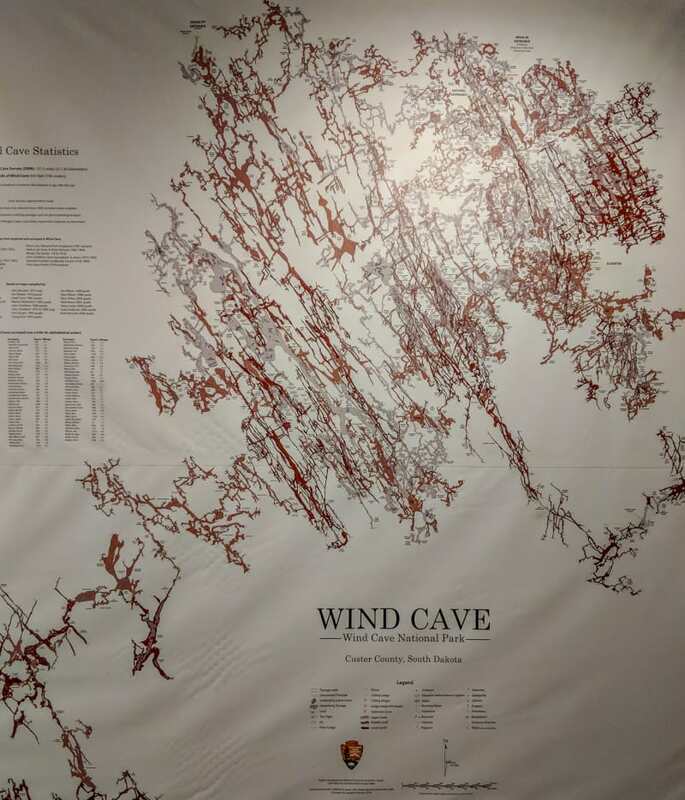 A map of Wind Cave. There are still many unexplored areas. To explore the cave, we joined the guided Fairgrounds Tour. The tour was advertised as strenuous due to the number of stairs you’d climb, but the pace was slow enough that you never even noticed. I’d definitely recommend it for anyone wanting to explore the cave. 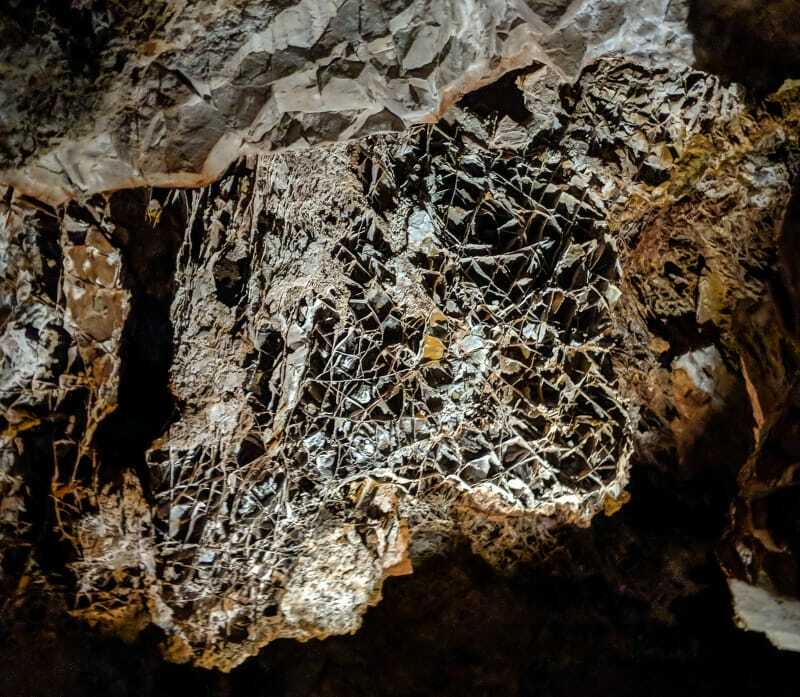 It’s a relatively dry cave, so there aren’t the usual stalactite and stalagmite formations you’d expect in caves; however, it is home to 95% of the world’s boxwork formations and you can also see frostwork and popcorn formations. On our tour, we also met Emily and Joe of The Vantastic Life, another full-time travel couple. They started at about the same time we did, but they’re traveling west to east. We talked about life on the road and exchanged travel suggestions. They were super friendly and a lot of fun to chat with. You should definitely follow along with their travels as well. After the cave tour, we drove the loop through the park. 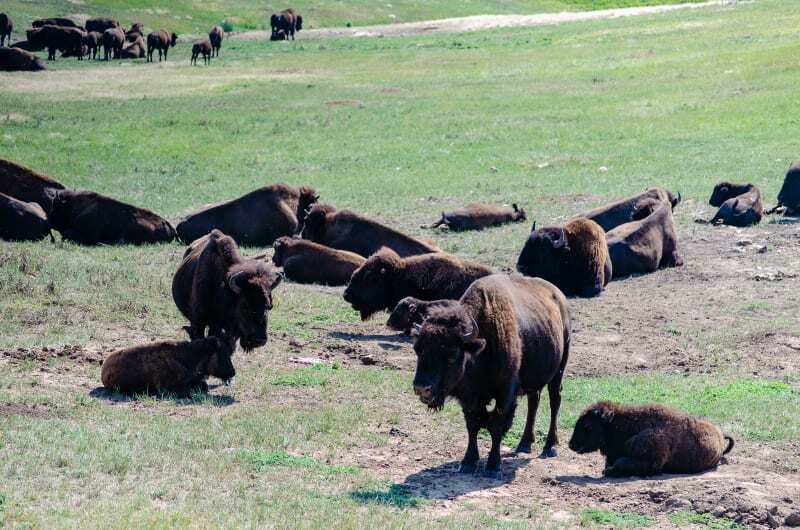 Similar to Badlands, Wind Cave National Park also includes a large mixed-grass prairie, and they were one of the first places that bison were reintroduced in the wild (after Yellowstone). 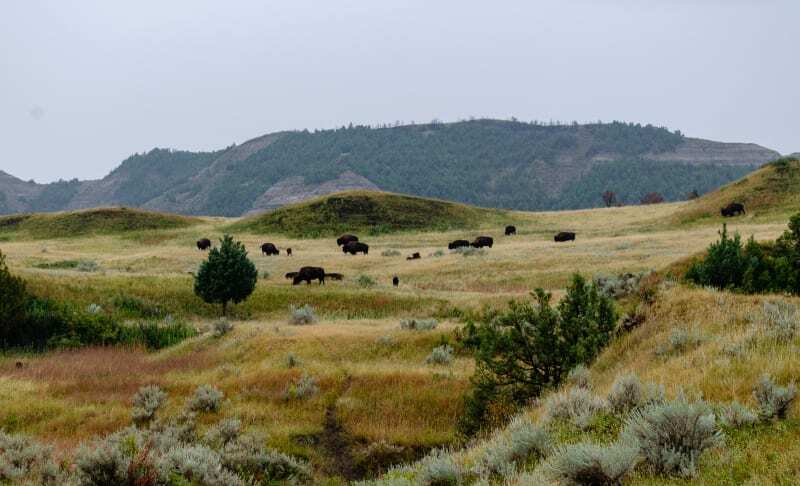 We saw a few bison in the Badlands, and I’d seen them other places before that; however, I’d never seen a full herd of Bison before! We also saw our first Pronghorn Antelope at Wind Cave. We knew they were in the area, but we hadn’t seen one yet, so we were super excited4. We left Wind Cave and drove North into Custer State Park. I wasn’t even aware the park existed before arriving in the area, and we really only discovered it because it lies between Wind Cave National Park and Mt. Rushmore National Memorial. It’s a beautiful park, though, and a top rated wildlife destination. We drove around the Wildlife Loop Road, but a storm was moving through, so we didn’t get to see very much. 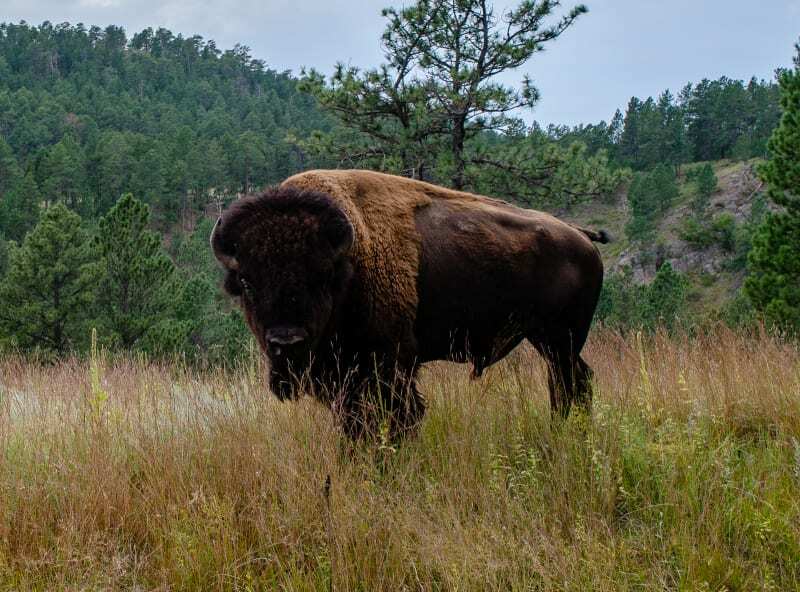 The park is home to a herd of 1500 free-roaming bison. We saw a small part of the herd, but they were hiding from the storm, so we didn’t have a great view. We also saw some of the park’s burros which are donkeys that used to give tourists rides to the top of Harney Peak. When the rides were discontinued, the burros were released into the park and allowed to roam freely. 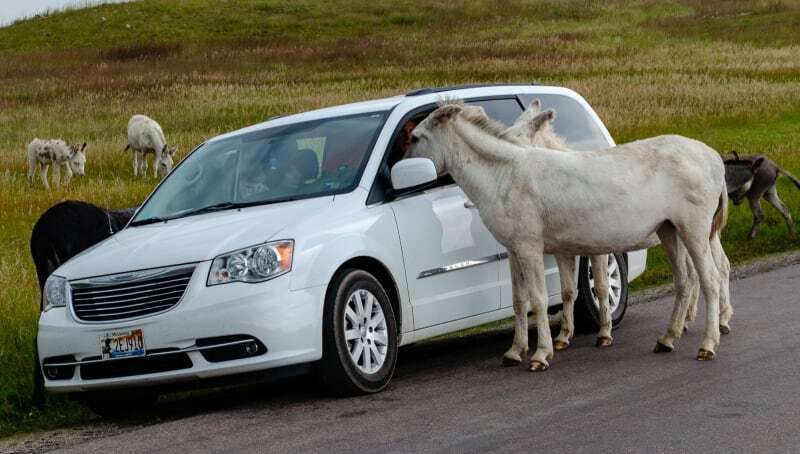 When we saw them, they were sticking their heads into car windows trying to get food. We were pretty appalled that people were feeding them since, normally, feeding wildlife is strictly prohibited and can lead to the animals’ deaths5. We looked into it later, though, and it turns out that feeding the burros is an exception (they aren’t really wild, anyway). Before leaving, we stopped at the visitor center, and they had the best park movie we’ve seen at any park, state, national or otherwise. If you ever visit the park, you definitely need to stop and see it! The video included footage from the annual buffalo roundup which looks amazing, but unfortunately we were a few weeks too early for it. We left on Iron Mountain Road, one of the park’s scenic drives. 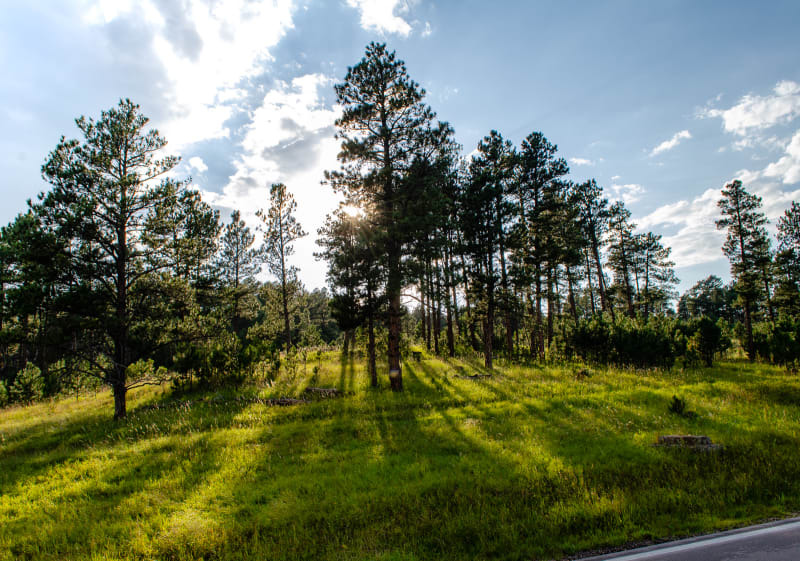 It passes through some beautiful parts of the Black Hills forest, and it was a great drive. We hoped to drive on Needles Highway, the park’s more famous scenic drive, but we wanted to arrive at Mt. Rushmore before dark, and it was already pretty late. Next time! 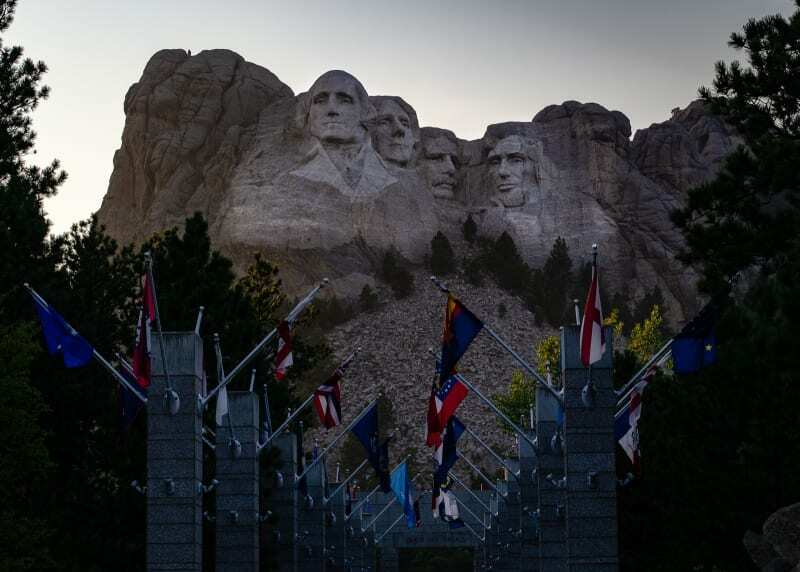 The final stop on one-day tour of the Black Hills was Mount Rushmore National Memorial. I wasn’t really sure how interesting it would be, but given it’s fame, it felt like a must-see. It more-or-less met expectations. It was cool to see - the sculpture is definitely impressive - but it was super touristy and felt over-hyped. 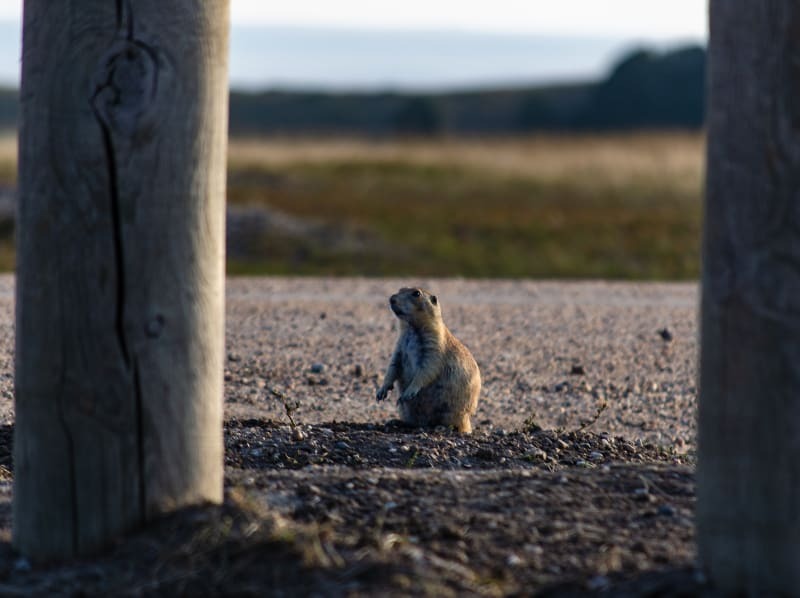 The park gets more visitors each year than Badlands and Wind Cave National Parks combined, but it was nowhere near as interesting as either of them. I’m glad South Dakota found a way to attract people to visit the area, but I feel bad for everyone that comes to see Mt. Rushmore and misses out on all of the far more interesting sights in the area. While in the area, we also attended an RV meetup organized by the wonderful Brittany and Eric of RV Wanderlust. We met for dinner in Rapid City, SD, and then socialized in the nearby park afterwards. 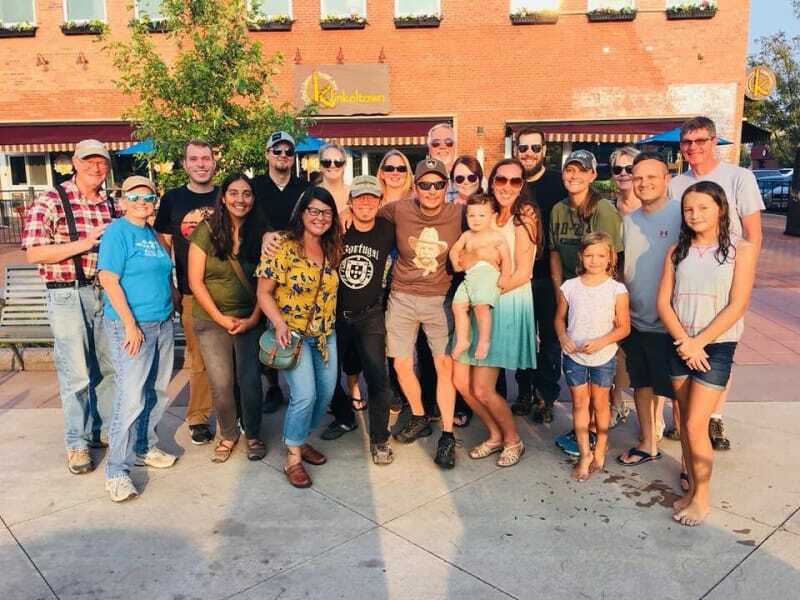 We had a great time and met some awesome full-time RVers! 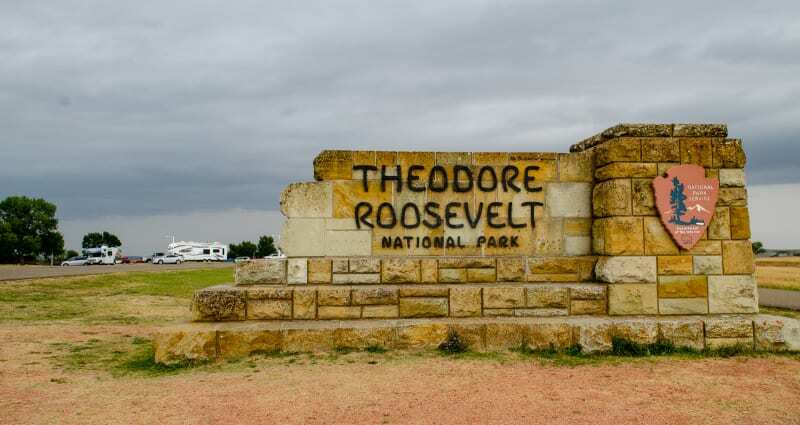 We left South Dakota and headed to North Dakota and visit Theodore Roosevelt National Park. We were short on time, but we wanted to check off both the state and national park while we were close. We arrived late in the afternoon, and we stopped at the Painted Canyon Visitor Center which was right off the highway. 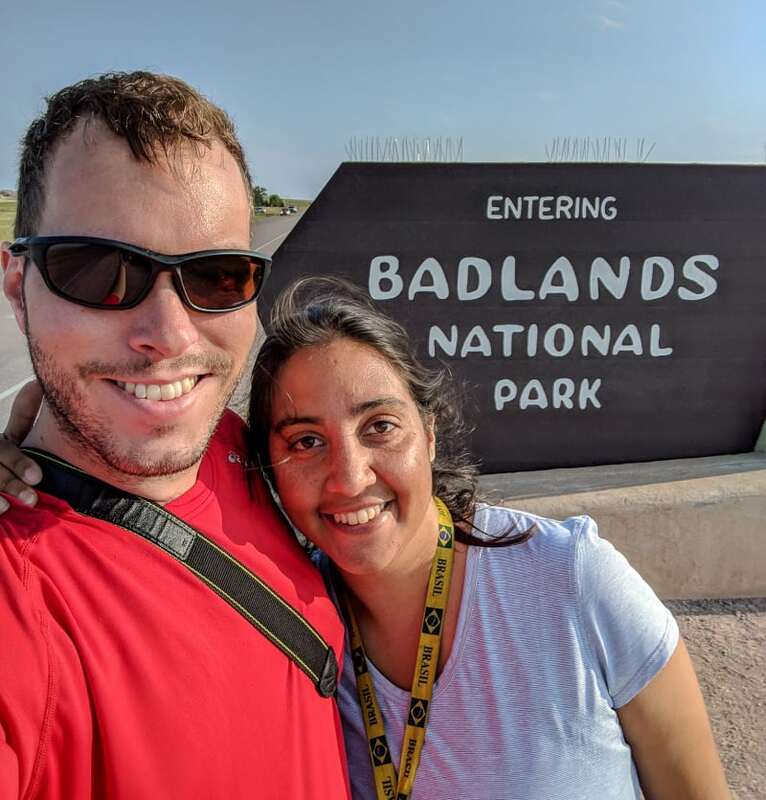 We chatted with the rangers, and they told us they allowed RVs to camp in the parking lot overnight, so we decided to stay there rather than moving on and looking for another boondocking site. It ended up being a great spot to camp. After the visitor center closed, the only people around were other people camping, so it was nice and quiet. The spot had great views, too. 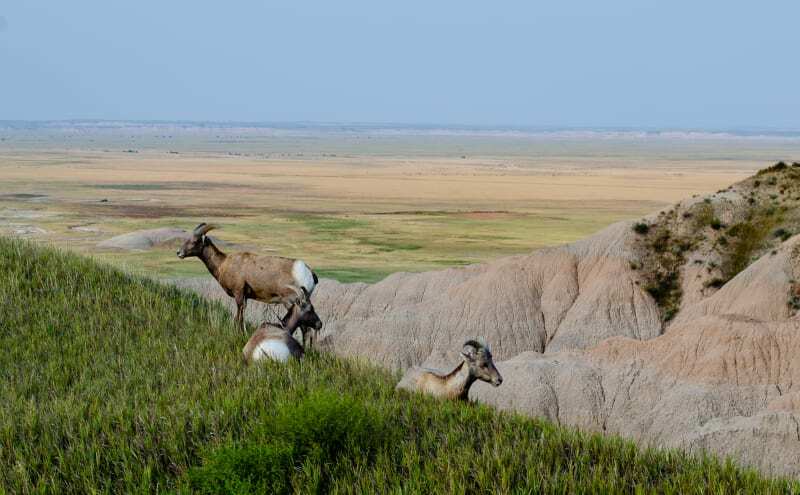 As the name suggests, it overlooks the Painted Canyon section of the park which has many colorful badlands formations. We watched sunset at the overlook, and we hiked the nearby trail into the canyon to explore a bit. 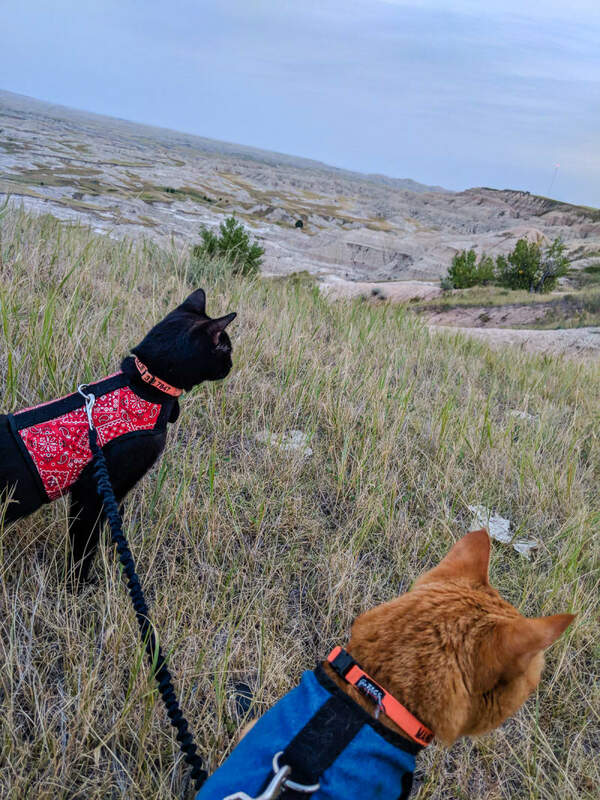 We also took the kitties for a long walk, and Mango hiked his first trail! It wasn’t a long hike, but he stayed right on the trail. 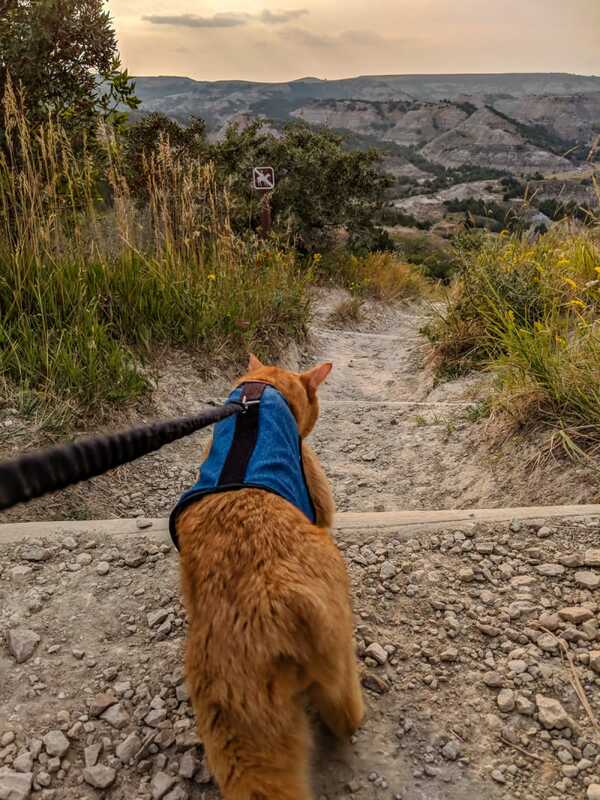 Mango hiking his first trail! The following day, we went into the main section of the park and drove the park loop road. Unfortunately, it rained the entire day, and I was coming down with a pretty bad cold, so we didn’t end up doing much else in the park besides stopping at overlooks. It seemed like a really cool park, though. 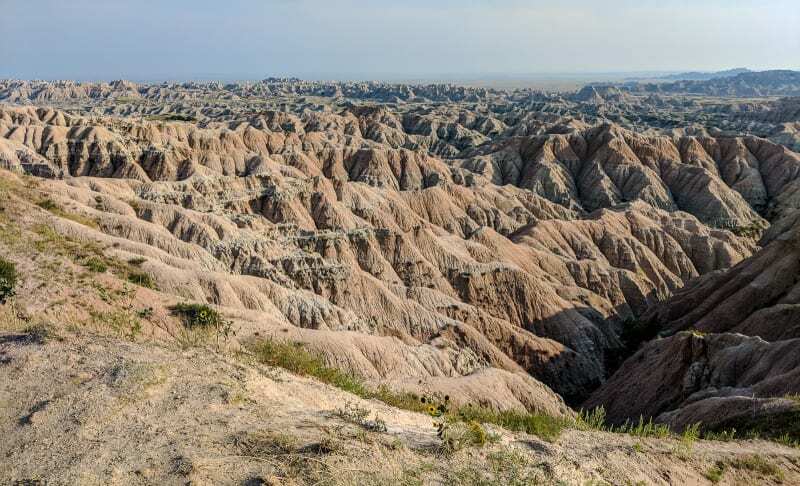 It was similar to the Badlands in that it was a combination of prairie and badlands rock formations; however, it was more of a rolling prairie with many hills and valleys. 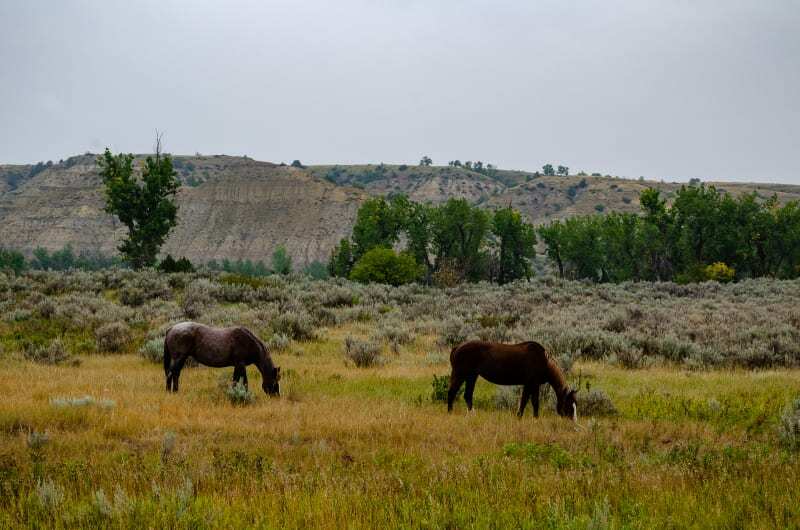 It seemed like a great place to hike, view wildlife, and experience the area as it must have felt when Teddy Roosevelt was there in the late 1800s. 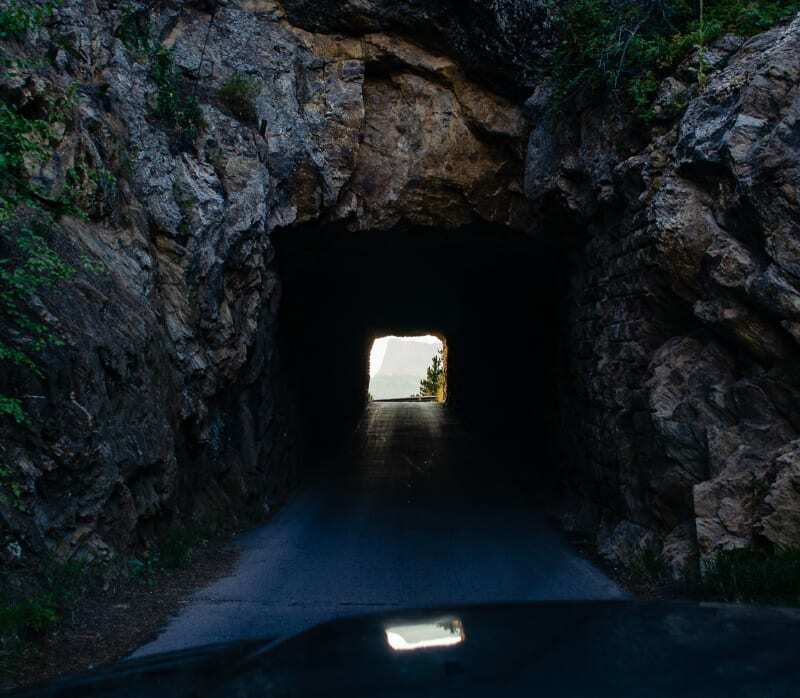 We travel on to Helena, Montana, to spend time with family, explore ghost towns, mine for gold, and soak in hot springs. 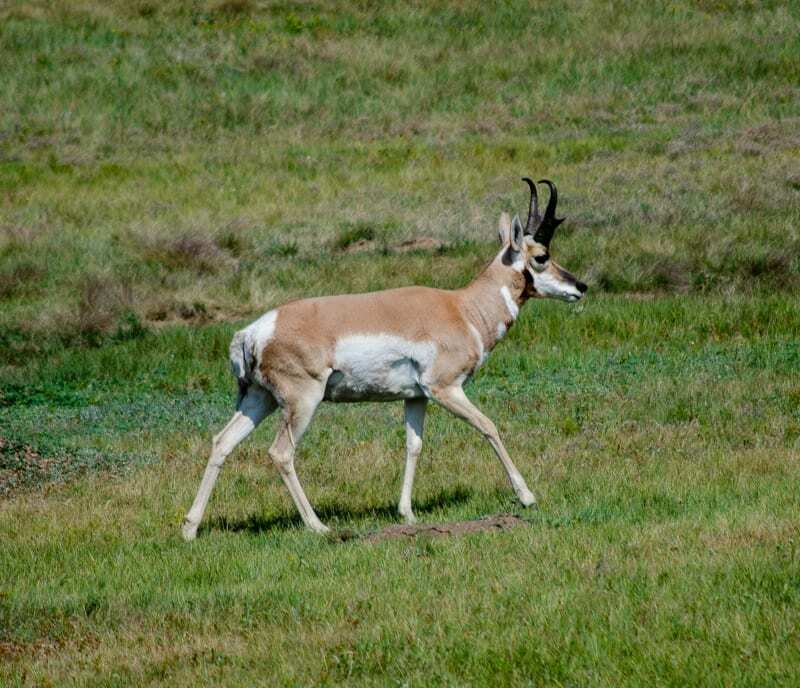 We have since learned that Pronghorn are common in this part of the country, and we saw hundreds driving through Wyoming, but we didn’t know that when we were at Wind Cave.